Apparently Jim McMahon was on to something (this pains me because he played for Da Bears). Shoes replicating a barefoot experience are all the rage in running and are now infiltrating golf. I get excited when a new technology hits golf, but I never thought I would be excited over golf shoes (I sound like a giddy Al Bundy). Golf is hit with a new fad every few years and you can usually spot it and predict its death. However, I think this fad is here to stay because it’s based on science. The theory, which makes perfect sense, is we are born with flat feet and we move better barefoot. Elevating your heel with traditional golf shoes throws you off balance (although we feel like we get used to this). Not only do you move better, but going back to a flat stance also has benefits for your low back. Sam Snead used to hit balls barefoot. Though we doubt your local country club would wish you to show up with no shoes to play a round (Slamming Sammy could get away with this). The minimalist approach brings the foot into closer contact with the ground. In addition, it lowers your balance point and actually makes the swing easier. Early adopters (way behind Jim McMahon) for minimalist golf shoes are Ryan Moore and Tiger Woods. “Natural motion” footwear, shoes that try to mimic the barefoot experience, are gaining popularity. As golfers are tuning in to their physical fitness and health, companies are taking notice. Companies like TRUE Linkswear and Nike have adopted golf shoe designs loosely based on the “five finger” concept that has moved through running and hiking. Now Adidas is introducing its own version, with two new models called Puremotion and Crossflex. The best thing about these new shoes is that you can wear them in your kitchen or to the store safely. Both shoes are due on sale this summer. Puremotion, is an advanced golf shoe with an “anatomical shape” and spikeless sole. Featuring a wider, Puremotion offers a “web-shaped forefoot” that Adidas says provides a natural fit for comfort and performance. Adidas claims this will lock you in place, your toes still have room to grip down during your swing. The Crossflex is built on a lightweight running shoe — shaped like a human foot. Instead of spikes, the Crossflex has “pods” and “zonal traction elements” for grip in various ground conditions. Both shoes have Climaproof mesh uppers and carry a two-year waterproof guarantee. I encourage you to make the switch to a flat shoe. It does take time to get used to and you should wear them around the house or running errands to get used to the feel. 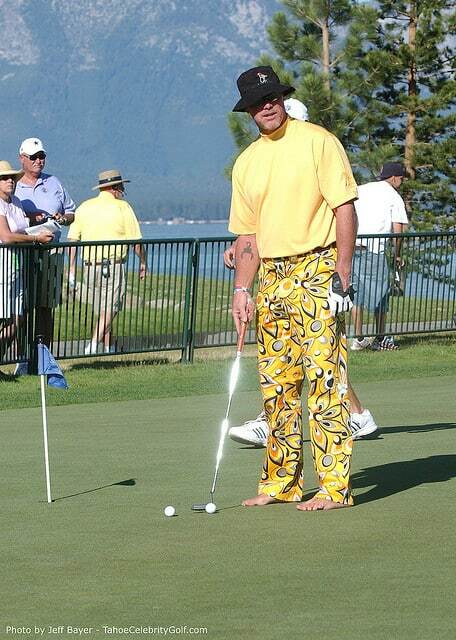 Whatever is next, we know Jim McMahon is probably already experimenting in his super secret golf lab.